Food & Beverage « Global Market Insights, Inc. Endorsing itself as an intrinsic realm in winemaking process, tartaric acid market stands to gain much over the ensuing years, on virtue of its credential to maintain chemical stability of the wine. This organic acid, in fundamental terms, has been commercialized since ages, however in recent times the business space has garnered an appreciable popularity. As per experts’ opinion, a large credit of this goes to the massive wine consumption across the globe lately. Statistics claim, in 2016, wine consumption worldwide was approximately around 242 million hectoliters, an increment of almost 16 million hectoliters from what it recorded in 2000. 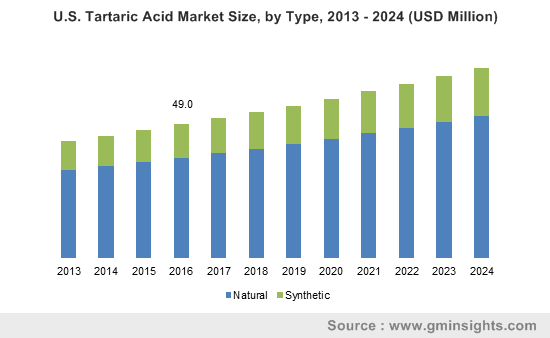 In the same year, global tartaric acid market garnered a revenue of USD 450 million-estimates validating the perpetual impact of one on the other. The reason behind U.S. to become the hotbed for tartaric acid market investors is quite obvious – the region’s expanding wine sector. According to a latest report by Wines & Vines, nearly 9,091 wineries were operational in the country in 2017. The country also pegged the title of fourth largest wine production nation across the world with a production volume of almost 23.9 million hectoliters in 2016. 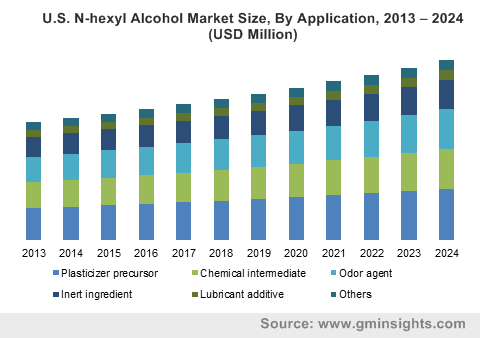 These estimates vividly exhibit the growth scope of regional tartaric acid market from wine applications. In this regard, natural wine has created much of a buzz among the wine lovers on grounds of its health viability. 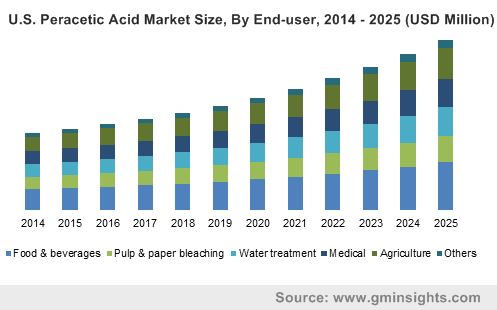 As per estimates, overall wine applications witnessed a proportion of authority in global tartaric acid industry share in 2016 and is likely to continue its dominance over 2017-2024. Having said that, it is prudent to mention that potential contenders are leaving no stone unturned to explore the possibilities of this acid on other application verticals as well. 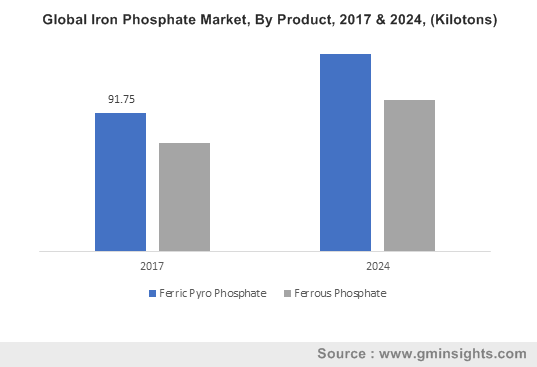 In this regard, an anticipated trend of utilizing tartaric acid as an anodizing agent for corrosion protection, has generated quite a momentum in tartaric acid market. Citing a relevant instance, Airbus leading aircraft manufacturer has developed a chrome-free Tartaric Sulphuric Acid Anodizing (TSA) as an alternative to traditional chromic acid anodizing that are used in corrosion resistant process. Reportedly, on ground of its environmental viability, TSA has also received a green signal from REACH. The utilization of tartaric acid anodizing process, as per experts’ opinion, undoubtedly falls among one of the few disruptive trends that tartaric acid industry has lately witnessed. This is validated by the increasing number of initiatives that are being undertaken along the similar lines. For instance, Aequs and Magellan Aerospace, two of the most renowned aircraft giants, few years back, signed an agreement, in a bid to expand a special TSA unit in India. Dubbed as Aerospace Processing India, this joint venture plant mainly carries out cadmium plating and TSA anodizing process for OEMs in aerospace sector. This project is also considered as a symptomatic evidence depicting the extent by which tartaric acid market penetrated the aerospace sector. It is imperative to mention that natural tartaric acid is comparatively costlier than its synthetic counterparts. This is deemed to be one of the fundamental factors acting as a stumbling block in tartaric acid industry’s linear growth path. 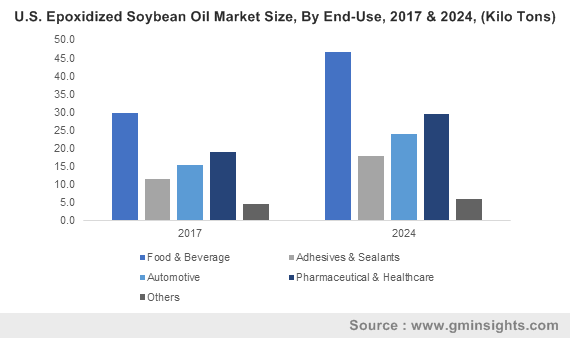 Add to it, with restrictive consumption of synthetic tartaric acid due to stringent regulatory framework, across a plethora of verticals including the likes of pharmaceutical, food & beverage, and wine production, the profit margin further squeezes. However, increasing consumer inclination toward heathy foods and growing commercialization of beverages having fruit flavors, is likely to widen the application opportunities of the business space over the coming years. This entry was posted in Bulk & Specialty Chemicals and tagged FMCG, Food & Beverage, Natural, Pharmaceutical, Synthetic, Tartaric Acid Market, Tartaric Acid Market Analysis, Tartaric Acid Market Report, Tartaric Acid Market Size, Wine, World Tartaric Acid Market. In recent years, silver nanoparticles market has emerged as one of the most lucrative business spheres pertaining to the increasing product acceptance across the healthcare and food processing sectors. Silver nanoparticles are prominently integrated into medicines used to treat various infectious diseases including influenza, diarrhea, cholera, and so on. An upsurge in disease burden has been observed across the global economies lately, owing to the surging prevalence of infectious diseases. In order to prevent such outbreaks of infectious diseases, most of the healthcare service providers have suggested the deployment of silver nanoparticles owing to its unique property such as high antimicrobial activity. Though toxic in nature, the use of silver nanoparticles is still being researched, to increase their applicability for infectious outbreaks. The rising involvement of the scientific community in discovering the effective usage of silver nanoparticles in biomedical devices is slated to boost the product demand over the years ahead. Recently, Russian scientists carried out a study to find the eco-toxicity of silver nanoparticles. Since it is vital ingredient is various medicinal formulations and other industrial applications, experts are continuously studying the safety characteristics and risk factors associated with the use of silver nanoparticles. In addition, some of the pioneering biotech companies have been putting their efforts to increase the number of research and development activities to manufacture high-grade cosmetics and nutraceuticals. Taking into account the primary use of silver nanoparticles in drug formulations, leading medical product manufacturers have been looking forward to acquiring research organizations that have been involved in the development of new formulations. For instance, recently, Apotheca Biosciences unveiled a plant to purchase Nano Creaciones S.A. P.I. de D.V. Research LLC, also known as Nano, which is known for its patented work in the formulations of several medical remedies. Currently, it has been developing cutting-edge nanotechnology that would be used for the development of cotton fiber gauze with silver nitrate nanoparticles which can be deployed for the tissue generation process. This acquisition is also slated to emerge beneficial for Apotheca Biosciences to strengthen its knowledge and level of expertise in the development of CBD products. In addition, it will also enhance its delivery technologies and product portfolio comprising sublingual and transdermal solutions. It is rather discernible that with the adoption of various strategies like mergers and acquisitions, silver nanoparticles market contenders have been attempting to consolidate their stance in the industry. Driven by the product’s versatile usage in medical applications, Global Market Insights, Inc., forecasts silver nanoparticles market size from healthcare & life science applications to be pegged at an appreciable USD 1 billion by 2024. Over the last few years, numerous start-up companies have invested in this business vertical, considering the product’s remarkable use in textile applications. The New Jersey-based PurThread is also one of the startup companies that had invested USD 9 million in the development of silver nanoparticle-based solutions to destroy microorganisms in the textile fibers. This technology has been extensively used across military, healthcare, and athletic applications for processing used clothes and textile fabrics. Reportedly, in 2017, textile application accounted for a 25 percent share of silver nanoparticles industry. The continuously increasing adoption of silver nanoparticles across the textile industry will further fuel the market trends remarkably. In addition to the medical and textile applications, silver nanoparticles have also gained popularity across the food packaging sector. The shifting trends toward the consumption of packaged food along with the prevalence of strict regulations related to packaged food hygiene have also been promoting the usage of silver nanoparticles. In the U.S., the federal government has implemented food hygiene regulations and food safety standards to ensure consumers’ safety. 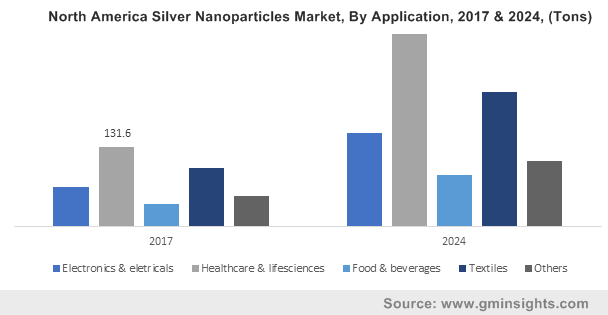 The strict initiative taken by the U.S. government has encouraged most of the food processing industries to use silver nanoparticles commercially, which has had a positive impact on the product demand. 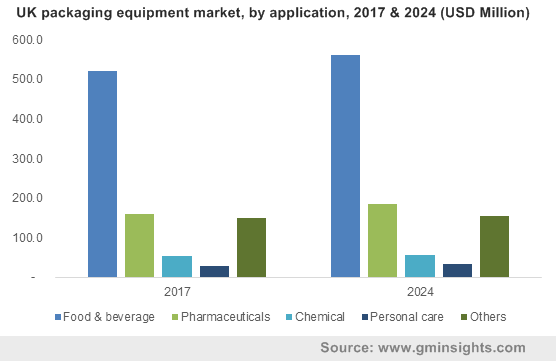 For the record, with increasing importance for hygienic packaging trends, food and beverages application is poised to generate a revenue of more than USD 300 million in silver nanoparticles industry by the end of 2024. It is noteworthy to mention that despite having toxic properties, silver nanoparticles have emerged as one of the most massively demanded specialty chemicals. Significant use of nanoparticles in most of the medical formulations will further augment the industry share over the years ahead. The rising efforts by the industry magnates to gain dominance across myriad regions will further expedite silver nanoparticles market. As per estimates put forth by Global Market Insights, Inc., silver nanoparticles market is poised to surpass a revenue collection of USD 3 billion by the end of 2024. This entry was posted in Bulk & Specialty Chemicals and tagged Electronics & IT, Food & Beverage, Global Silver Nanoparticles Market, Healthcare & Lifesciences, Silver Nanoparticles Market, Silver Nanoparticles Market Size, Textiles.